Who wants to be a princess, when you can eat like a queen? PITTSBURGH & CHICAGO--(BUSINESS WIRE)--The world’s most sought-after bachelor is off the market, and the chance to become a princess is suddenly gone. We’ve always been told that the life of a princess is something to aspire to… the castles, the luxury, the fame, the gold. The truth is, the royal treatment can be tough – so much curtsying, no selfies, and so many outfit changes – so Velveeta Shells & Cheese is giving people an even better crown, fit for a Queen. 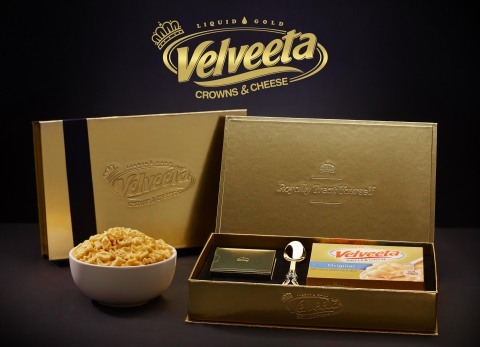 Velveeta Shells & Cheese is releasing a luxurious, extra indulgent edition of its Shells & Cheese: Crowns & Cheese. It has the same warm, rich and cheesy creaminess of Velveeta Shells & Cheese that makes for a decadent and delicious eating experience – but with the addition of crown-shaped pasta, because cheesy crowns are better than real ones anyway. Who wants to be a princess, when you can indulge in creamy Velveeta Crowns & Cheese and eat like a Queen. The crown-shaped pasta is packaged alongside the original Shells & Cheese and a gold-plated spoon in a deluxe gold foil box. 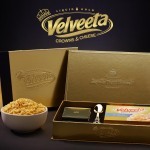 Velveeta will be offering the boxes of Velveeta Crowns & Cheese to the first people to enter on www.RoyallyTreatYourself.com, while supplies last. Join the conversation: @Velveeta on Instagram and @EatLiquidGold on Twitter. The Kraft Heinz Company (NASDAQ: KHC) is the fifth-largest food and beverage company in the world. A globally trusted producer of delicious foods, The Kraft Heinz Company provides high quality, great taste and nutrition for all eating occasions whether at home, in restaurants or on the go. The Company's iconic brands include Kraft, Heinz, ABC, Capri Sun, Classico, Jell-O, Kool-Aid, Lunchables, Maxwell House, Ore-Ida, Oscar Mayer, Philadelphia, Planters, Plasmon, Quero, Smart Ones and Velveeta. The Kraft Heinz Company is dedicated to the sustainable health of our people, our planet and our Company. For more information, visit www.kraftheinzcompany.com.